Industry is the sector of the economy concerned with the production of goods and services. Major businesses in this sector include agriculture, fishing, forestry and all mining and quarrying industries. 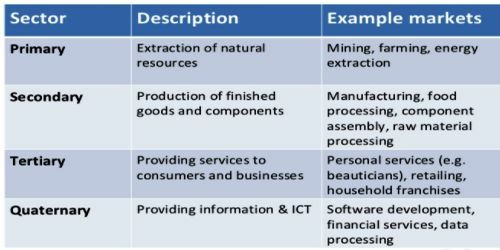 The four Sectors of Industry are interrelated. An individual industry will often use more than one sector in order to produce products. The primary sector of industry is also called extraction. It generally involves changing natural resources into primary products. Most products from this sector are considered raw materials for other industries. Primary industry is a larger sector in developing countries; for instance, animal husbandry is more common in Africa than in Japan. The secondary sector (manufacturing) produces finished, usable products. This sector of industry generally takes the output of the primary sector and manufactures finished goods or where they are suitable for use by other businesses, for export, or sale to domestic consumers. This sector is often divided into light industry and heavy industry. Example: Aerospace manufacturing, Automobile manufacturing, Brewing industry, Chemical industry, Clothing industry, Electronics, Engineering, Energy industries, Metalworking, Steel production, Software engineering, Telecommunications Industry, Tobacco industry etc. 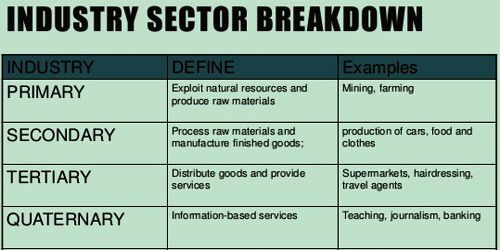 The tertiary sector of industry is also known as the service sector or the service industry. It involves the provision of services to businesses as well as final consumers. Services may involve the transport, distribution and sale of goods from producer to a consumer, or may involve the provision of a service, such as in pest control or entertainment. Goods may be transformed in the process of providing a service, as happens in the restaurant industry or in equipment repair. However, the focus is on people interacting with people and serving the customer rather than transforming physical goods. Example: News media, Leisure industry/hotels, Consulting, Healthcare/hospitals, Waste disposal, Estate agents, Business services, Restaurants, Local government services, Central government services, Education Law and order. The quaternary sector is the research industry. Industrial research looks for new ways to cut costs, find new markets, produce new ideas, new production methods and methods of manufacture.